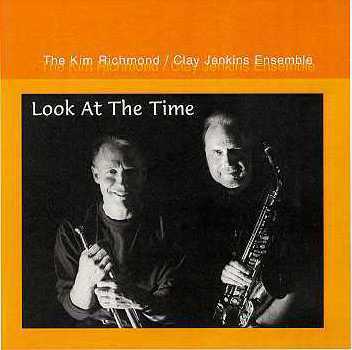 Kim Richmond, Musician-Recordings: "Look At The Time"
The title piece is by Clay. The composition consists of two uncomplicated ideas that have a wonderfully interesting but complex effect. I like this line with its unique changes, also the way Clay voiced the harmony on the second chorus. The rhythm section provides a subtle burn. Written by our bassist Trey Henry, this composition sets up an exotic, hypnotic mood over which the melodic line unhurriedly unfolds and blossoms. One of the two standards on this CD, this number is my interpretation of a song that is fun to play on. The augmentation of the line and form, as well as the “pedal tags” under the solos, provide a framework for creative playing. This composition is dedicated to my wife Chris, an artist. My goal was to write a cohesive contiguous melodic line. The piece has a mysteriously romantic underlying tango “vibe.” Dave Scott in particular turns in a wonderfully probing solo. This odd-paced bebop line is designed to “turn the time around” on the listener. Clay plays an outstanding solo which shows his talent for motif development. On part of my chorus I get to interact with drums only. Named for Clay’s daughter Kelley, this beautiful and lyrical ballad features the baritone of Bill Perkins. Both Perk and Clay turn in inspired dramatic solos. One of my “stop/start” compositions, this piece consists of two diverging and often independent lines that avoid a common tonality or regular time feel. The solo section is entirely “free” and each time it is performed, the musical result is completely different. My arrangement of this Dizzy Gillespie bebop standard has a Latin flavor with a different treatment. All soloists get a chance to blow on both elongated changes and the traditional ones. We have played together as an Ensemble for many years and are dedicated to performing modern jazz with a direct relationship to Bebop, along with elements of a new freedom and looseness. We always strive to maintain a link to our jazz roots. In my opinion Clay Jenkins, my co-leader, is the consummate creative jazz performer. His dedication to the jazz artistic ideal is unquestionable and uncompromising. He is one of my favorite jazz soloists and his talent for building a solo via creative motif development is the best I've heard. He is also a wonderful teacher of jazz, which is very evident to me when we go on the road several times a year and do clinics, workshops and concerts. There are very few CDs, such as this, that have drum solos on most of the selections. But drummer Joe La Barbera has such a great sense of melodicism and style combined with exciting drive, great touch and technique, it is always a pleasure hearing him play, whether solo, ensemble, or in accompaniment. Dave Scott is a brilliant musician on many fronts. He is a fine jazz trumpeter (he is member of the trumpet section of my Concert Jazz Orchestra) and composer as well as an excellent and intuitive pianist. Trey Henry is one of the most in-demand bassists on the Los Angeles music scene. An outstanding jazz player, he is a superb talent in every style of music from free improvisation to classical.